Usually we do not offer standard / prepared in advance tours, as agencies do in general, that doesn’t mean that we cannot perform them, it’s just that we have a different approach. Depending on available time and the area of main interest we suggest itineraries and objectives of possible tours in an efficient travelling manner. This is usually backed up by the priorities and the touristic objectives already in mind of the travelers. Regions of Transylvania can be easily combined with some from Hungary, maybe a city tour of Budapest. It is also worth considering the option of flying to and from Budapest Airport, even if you have in mind only regions and objectives in Transylvania. Transylvania, Romania even more, represent a vast and very diverse area. In our opinion a good idea would be to pick a region and exploit its full potential. We just prepared a short list of such possibilities, including some of the particularities, main objectives, and flying options. 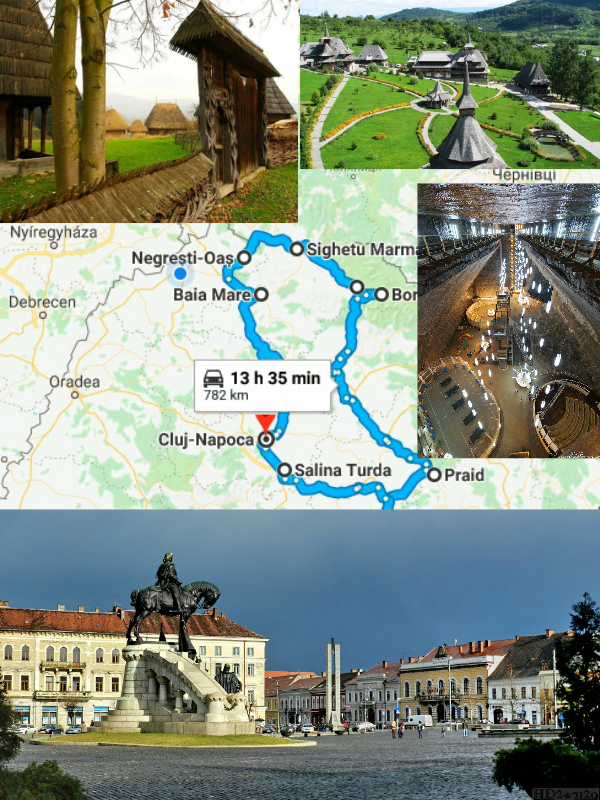 Must sees: museums in Sighetu Marmatiei, Barsana Monastery, Mocanita – The Narrow Gauge Steam Train, Horses Water Falls, wooden churches, traditional households and craftsman, the salt mine in Turda. Activities: open air tours, mountain trails / sightseeing of mountains, lakes and waterfalls, the Mocanita circuit on the Vaser Valey, visiting isolated villages, bounding with locals and craftsman, picnic, local eats and drinks. Particularities: very well preserved rural life, traditional villages, welcoming people, and spectacular mountain landscapes + multicultural urban atmosphere (Cluj). Flights: via Cluj Napoca Airport (Lufthansa direct or KLM, AF, LH, BA + WizzAir). Recommended duration: 6 - 8 days. 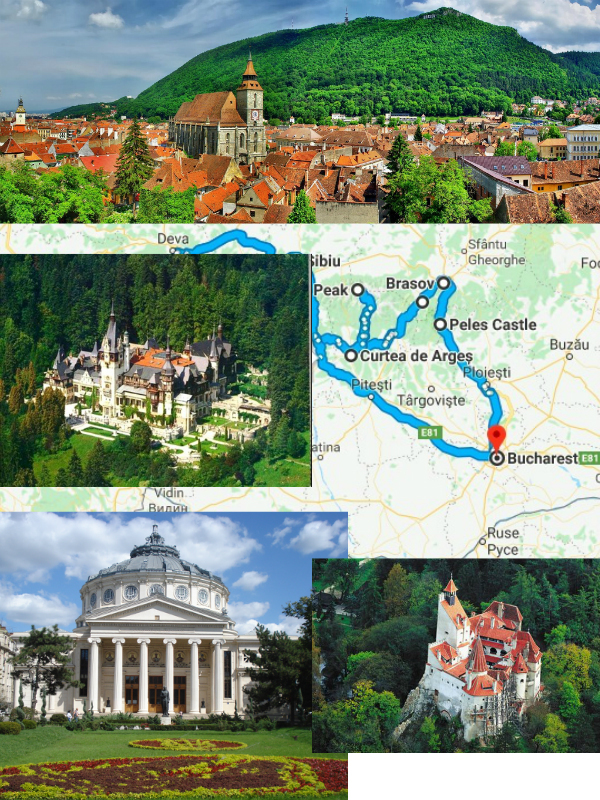 Must sees: Bucovina and Sighet Village Museum, at least Barsana and Putna Monastery, Horses Water Falls, wooden churches, glacial and natural lakes, Royal Citadel in Suceava, traditional households, memorial houses and craftsman. Activities: open air tours, mountain trails, lakes and waterfalls, steam trains, visiting isolated villages, bounding with locals and craftsman, picnic, local eats and drinks, short city and historical site tours. Particularities: very well preserved rural life and traditions, welcoming people, spectacular landscapes, traditional crafts, monasteries & historical monuments. Recommended duration: 7 - 9 days. 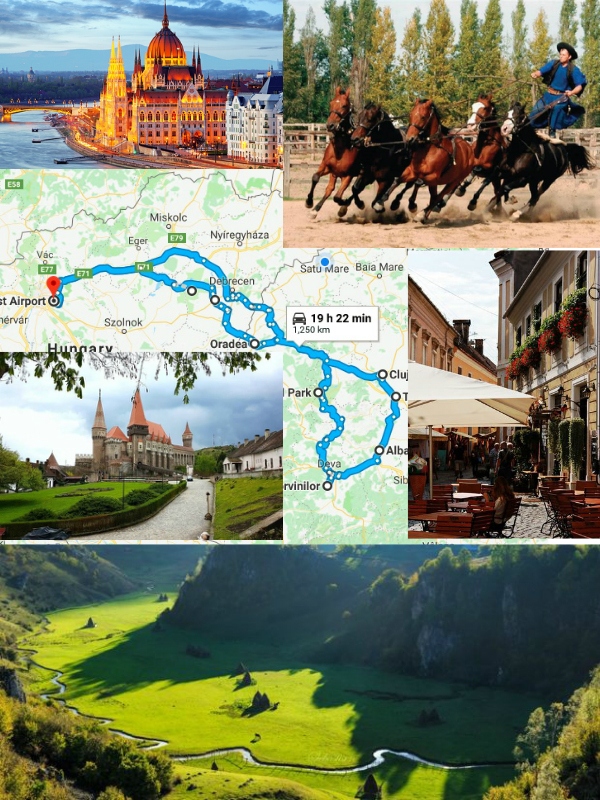 Must sees: Budapest city tour + evening boat trip; Hortobágy National Park; museums in Sighetu Marmatiei, the Merry Cemetery in Sapanta, Rodnei Mountains National Park, Horses Water Falls, wooden churches, traditional households and craftsman, the salt mine in Turda and the city of Cluj Napoca. Activities: city breaks, mountain trails, lakes and waterfalls, visiting isolated villages, vine tasting and other local eats and drinks. Particularities: neo-Gothic architecture, heritage of the Austro-Hungarian Empire, spectacular mountain landscapes + multicultural urban atmosphere. Recommended duration: 10 - 12 days. Must sees: Corvin Castle, The Apuseni Mountains and a few traditional villages, The Scarisoara Ice Cave, the second biggest underground glacier in south-eastern Europe, The Roman Gold Mine Galleries in Rosia Montana – more than 2000 years old; the Citadel of Alba Iulia, the salt mine in Turda and the city of Cluj Napoca; Budapest city tour + evening boat trip; Hortobágy National Park. 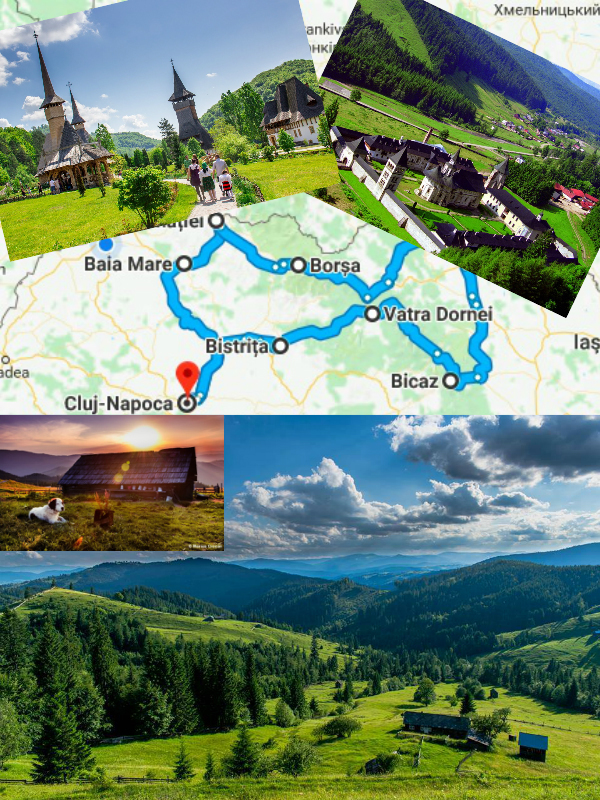 Activities: city breaks, mountain trails, lots of spectacular caves and waterfalls, visiting isolated villages, study of history and 18-19’Th century traditions - memorial houses of the most iconic historical Transylvanian characters. Particularities: spectacular geological formations, gold mining, heritage of the oldest native Transylvanians, very well preserved traditional villages, spectacular mountain landscapes + multicultural urban atmosphere. Must sees: the city of Bucharest - Palace of Parliament (The People's House), Romanian Athenaeum, outdoor Village Museum, University Square, Romana Square, Victory Square, Arch of Triumph, House of the Free Press, historical center, Herastrau and Cismigiu Park, Mogosoaia Lake and Palace, Castles of Southern Transylvania: Peles, Bran, Rasnov, Corvinilor, Transfagarasanu and Transalpina Road with spectacular mountain landscapes. 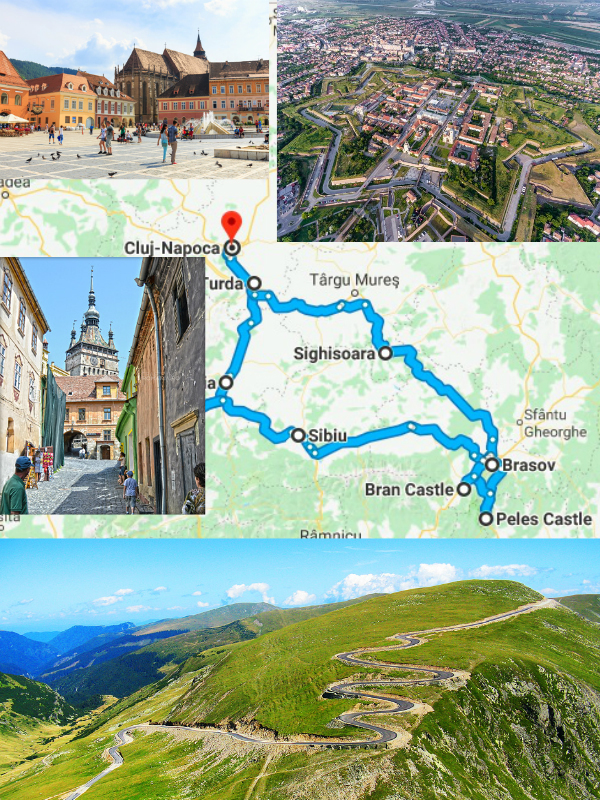 Activities: city tour of Bucharest, Sibiu, Brasov, Transylvania Castle Tour, mountain touring by car, on foot, with the chairlift. Particularities: bohemian markets and promenade, lots of historical heritage, an interesting mixture between medieval sites, communist symbols and modernism; spectacular mountain landscapes + multicultural urban atmosphere. Well preserved Saxone heritage in the cities and country side / villiges of Brasov and Sibiu. Flyights: Bucharest / Otopeni Airport. Recommended duration: 5 - 7 days. Must sees: Medieval castles – Corvin, Bran, Rasnov, Deva, Citadel of Alba Iulia, hystorical centers of Brasov, Sibiu, and Cluj, the medieval town and citadel of Sighisoara, the salt mine in Turda, some of the traditional villages with fortified churches, Southern Carpathians - caves, meadows, rocky steep walls, spruce forests, more than 80 glacial lakes, two of the most spectacular mountain roads in the world: Transfagarasanu and Transalpina winding around the mountain cliffs at hights over 2000m. Activities: city tours and urban leisure, mountain touring hiking / walking / trekking, wildlife and bird watching; caving, horse carriage / sled strolls, sightseeing and just enjoying nature. Particularities: historical heritage from the middle ages, very well preserved historical sites and country side, alpine and sub-alpine meadows, the highest peaks of the Romanian Carpathians.